The Vermont Agency of Transportation (VTrans) recently selected Hoyle, Tanner to take part in a three-year, statewide, covered bridge design contract with a limit of $1,500,000. Hoyle, Tanner was the top-ranked firm of 3 engineering design consultants chosen, underscoring our experienced team and dedication to excellence. Vermont is home to over 100 authentic covered bridges (representing the highest number per square mile in the United States), and VTrans makes preservation and maintenance of these iconic structures a top priority. Hoyle, Tanner will continue this tradition by providing “on-call” services to VTrans, which may include anything from project definition through the production of complete contract plans. Hoyle, Tanner’s experience with 32 covered bridge projects includes 11 different truss types, 10 presentations, and 8 covered bridge awards. 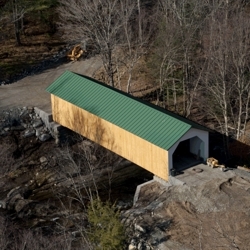 Our engineers have had a combined involvement in 15 different covered bridge projects in Vermont alone. This history, along with our long-standing relationship with VTrans, will make the next three years an exciting and positive period. In performing any required work, Hoyle, Tanner will enlist the help of our four specialty subconsultants, as needed: GZA Geoenvironmental will provide geotechnical and hydraulic engineering services; Hartgen Archeological Associates, Inc. will provide historic and archaeological research and documentation services; Vermont Survey and Engineering, Inc. will develop survey and Right-of-Way plans; and Kathleen Ryan Landscape Architect will be responsible for all landscape architecture services. This team was specifically assembled to address all of VTrans’ needs with regard to covered bridge projects. For more information about Vermont’s covered bridges, check out the sites below. These quaint pieces of history have an impressive fan base.